our DT has been working on. 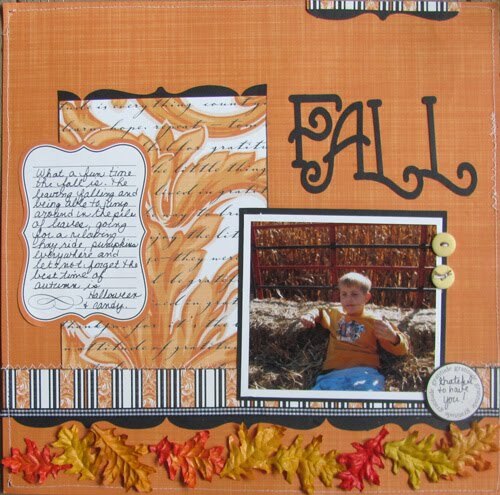 The majority of items that I used to create this layout came from the October QQ Layout Kit. I didn’t have a whole lot of Fall pictures that needed to be scrapped, so I thought Football..why not! And even better, the colors in the paper line matched my photos perfectly! 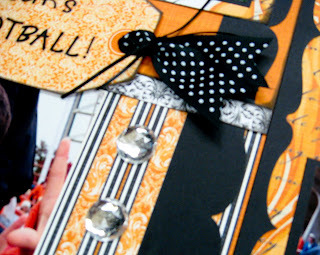 I used several of the Teresa Collins tags that came in this month’s kit. 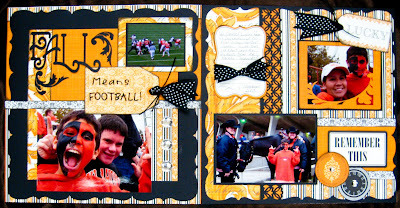 To finish my title, I added the words “Means FOOTBALL!” with letter stickers and popped the tag up off of the page using foam tape. I also added some of the Quick Quotes clear jewels along the side of the first page as well as to the centers of the diecut clock and orange circle element. Last but not least, I didn’t waste any of the gorgeous paper. I used the strip at the bottom of the paper that you are suppose to cut off and throw away. Yes, I actually used the strip that has the name of the manufacturer and paper line written on it! Can you spot it? It’s the thin black and white paper strip that runs through the center of my first page and at the top and bottom of the “Remember This” element on the second page! I love that if you look closely the paper already has some “words” on it that lend itself beautifully to the layout. Notice the Believe at the top right corner as well as the miracle & wonder on the bottom left? Fabulous, subtle touches! 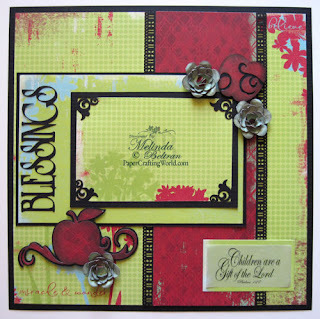 The quote on the bottom left is from the Babies, Kids & Family Itty BItty Box from Quick Quotes. The Flowers are from the: Groovy Times Cartridge. I cut them at two different sizes for a total of four different sizes. Midnight Confessions Powder Puff Chalk Ink pad to ink the edges of the apples and the flowers. After inking the flowers, I curled the petals to give them a dimensional look. I used the QQ designer paper for the flowers. 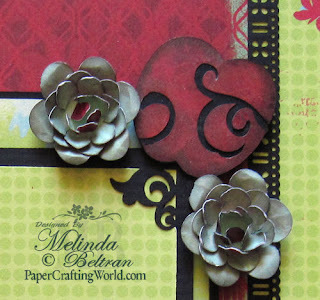 The weight of the paper makes cutting them out super easy and helps the flowers retain their altered shape. I used some pearlescent chalks from Pebbles Inc. to brush over the apples. It gives them a very soft shimmer that the photos just didn’t capture too well. The layout format came from our last challenge at Quick Quotes. While the challenge is over, collecting layout sketches and reusing them and flipping them is a great way to work on projects. I took the large black frame from the kit and cut it and used it as a border. Also bought a bag of fall leaves from my local arts and craft store and used the 3-in-glue to help hold them down, also to flatten them out I laid a book on top while the glue was drying. Gorgeous layouts, ladies! They are so different that I can't say which one is my favorite. I am completely inspired!!! beautiful work ladies!